Are you one of the many people that enjoy a crispy toast, some roasted potatoes, or really anything with that delicious crunch? What’s not to love- such food has pleasant texture, is often tasty, carcinogenic… Wait, what? Well-cooked foods indeed contain a compound that is known to cause cancer in animals and, likely, in humans. Before we all panic even more than we already do about healthy eating, let’s start from the beginning. What is this compound and why does it lurk in some of our most favorite dishes? Actually, I will start even further: Cooking itself is a crucial human skill. Not only has it allowed us to transform our environment by making inedible and toxic wild foods edible and safe, but it might have made us uniquely human. One of the major theories of why we have such large sophisticated brains is actually based on diet- learning to tame fire provided a lot more calories for the expansion of the brain in our evolutionary past (check up “Catching Fire: How Cooking Made us Human” by anthropologist Dr. Wrangham for more). Dating back to 400,000 years ago at least (with some suggestive evidence dating to about 1.6 million years ago), cooking is an activity to which we seem to be well-adapted, as suggested by our shorter digestive system and smaller jaws. Yet, this important human innovation is not without issues. Back to that potentially cancer-causing compound found in some cooked foods. The name is acrylamide and it is a product of an amino acid (found in many vegetables) that forms at high temperatures. Acrylamide would thus be found in many starchy foods cooked via frying and baking (the magic number seems to be over 120 degrees C or 248 F). The process that creates acrylamides is called the “Maillard Reaction” and is a chemical reaction responsible for the browning of foods when cooked. So if you look on the sliced bread photo on the right, you might guess that the darkest charred piece is highest in this compound. And you would be right. The health concern with acrylamides did not actually start with diet, as this chemical has been used in construction, cosmetics, and water treatment for the last 60 years. In 1994, it was classified as “probably carcinogenic” to humans based on animal studies (establishing safety guidelines for it in drinking water, food packaging, and occupational exposure). In 2002, however, the scientific community was alarmed to find out that high acrylamide levels can be found in common popular foods- coffee, fried potatoes, breakfast cereals, and baked products. That’s troubling news is you are a graduate student relying on a constant supply of coffee and cereal, I must say. Or if you are just about anyone in this fast-paced world, really. Acrylamide (AA) does not form in dairy, meat or fish products. Other than diet and occupational exposure, a huge source of acrylamides is tobacco. Smokers have 3-4 times more AA adducts (when they measure AA levels in blood) than those that don’t smoke. How does it cause cancer? AA is readily absorbed and metabolized in the body to glycidamine, a known animal carcinogen shown to have mutagenic effects and cause damage to chromosomes. Should we worry & how much? So how dangerous is this compound to our health anyway? Should we throw away our baking cookbooks? Avoid coffee shops like the plague? Fry less & avoid overcooking (burning, heavy crisping). 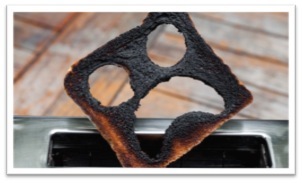 Least acrylamide-forming cooking methods are boiling, steaming, and microwaving . Eat a healthy balanced diet: one that contains a variety of fresh plant foods (fruits and vegetables). Take a look at these tips again- these isn’t anything shocking or new here and you probably already know that these are great strategies to feel well and maintain a healthy weight. While using less AA-forming cooking methods allows you to have less acrylamides in your diet in the first place, eating a plant-rich diet might reduce the effect of these compounds already in your food. Surely you’ve heard of antioxidants in fruits and vegetables and that they are somehow good for you. Antioxidants can prevent or delay cell damage and may lower your risk of certain diseases- such as cancer (see this short MedLine Plus article). Also, there is research showing that they can significantly influence acrylamide formation (Xu et al, 2014). The “common sense” healthy eating advice you probably already heard has a new exciting twist: not only is a diet rich in fresh fruits and vegetables and low in many fried convenience snacks or fast foods is good for a healthy weight and overall health, but it also decreases the amount of potentially cancer-causing compounds that can be found in so many modern foods! Many of us have hectic lives, so quick and convenient foods will remain a part of them.. yet easy changes to your meal preparation can be still made for a healthier diet. And no need to stress over that morning coffee! These folks looked at studies that measured dietary intake of AA, intake of AA-rich foods (french fries, fried potatoes), and measured actual biomarkers of AA in the body (took blood samples), which is nice since asking people about what they eat is a mess (people forget, people lie, etc.). The researchers found a lack of increased risk of most types of cancer from dietary and occupational exposure to AA. One of the studies they looked at showed significant increase in risk of kidney and ovarian cancer from high AA in diet (59% increase and 78% increase), but others showed no increase in risk at all. This was a nationwide study that looked at >600 people with esophageal cancer vs. 800 healthy individuals. They assessed their diet with a food frequency quesionnaire (this long thing you fill out asking whether you eat different foods and how often… they asked you to estimate your food intake over the last 20 years!!). These guys concluded that AA dietary intake in the Swedish population might result in increased risk of the cancer. There was a 23% increase among those consuming the highest amount of AA in diet, and this association was even stronger (88% increase!) in obese individuals. These guys followed > 470,000 people for about 11 years and had 865 folks with pancreatic cancer. They asked people about their diet (that long questionnaire again) + asked about details of cooking (temperature and methods of cooking) which is very important for AA estimation since it can vary with cooking methods. Researchers found NO ASSOCIATION between high AA intake and risk of pancreatic cancer. I want to raise a couple of warnings when looking at epidemiology work related to nutrition. Indeed, nutrition research seems to drive people crazy: one day coffee or eggs are bad for us, another- they provide positive health effects. How do you make sense of it all? It is important to understand the hardships that nutrition research must constantly deal with. Like with many specific nutrients and compounds, measuring acrylamides in foods is actually extremely hard. You first have to assess someone’s diet correctly (people don’t only forget what they eat, but they even lie in surveys to appear healthier), then estimate AA content through food questionnaires (because they are cheap and easy to collect, that’s what most large scale studies use) which can vary drastically between brands and cooking methods. Lastly, even the database for AA content of various foods are limited- if you can not physically measure AA levels in what people eat (which you wouldn’t-such research would be tremendously expensive!! ), you can reference existing databases that have AA contents of various foods. Such databases, however, might not have the exact food items you’re looking for and you’re stuck with estimating again. Lots of opportunities for mistakes here- a database might be based on a European region and you are studying diets in the US.. Or the AA amounts they have are from foods measured in 2002 and you’re trying to calculate AA in diets from the last 20 years. This is an enormous problem as you are simply measuring AA intake incorrectly (misclassifying AA intake) and the lack of association between dietary intake and cancer risk is really due to the measurement errors. In plain terms- we don’t see association between cancer and AA levels in diet not because AA doesn’t increase cancer risk, but because the methodology issues of studies do not allow us to detect this true risk. You might have heard that randomized controlled trials, as the gold standard of epidemiology, give the highest level of scientific evidence, so why not just do a bunch of those on acrylamides? Well, it would be quite unethical to randomize people to the high-AA group and feed them la diet of french fries and burnt toast with the expectation that it will cause cancer. *Pelucchi, C., La Vecchia, C., Bosetti, C., Boyle, P., & Boffetta, P. (2011). Exposure to acrylamide and human cancer—a review and meta-analysis of epidemiologic studies. Annals of oncology, 22(7), 1487-1499. **Lin, Y., Lagergren, J., & Lu, Y. (2011). Dietary acrylamide intake and risk of esophageal cancer in a population-based case-control study in Sweden. International Journal of Cancer, 128(3), 676-681. ***Obón-Santacana, M., Slimani, N., Lujan-Barroso, L., Travier, N., Hallmans, G., Freisling, H., … & Duell, E. J. (2013). Dietary intake of acrylamide and pancreatic cancer risk in the European Prospective Investigation into Cancer and Nutrition (EPIC) cohort. Annals of oncology, 24(10), 2645-2651. Xu, Y., Cui, B., Ran, R., Liu, Y., Chen, H., Kai, G., & Shi, J. (2014). Risk assessment, formation, and mitigation of dietary acrylamide: Current status and future prospects. Food and Chemical Toxicology, 69, 1-12.